Khorkhog is a Mongolian barbecue dish made using hot stones. 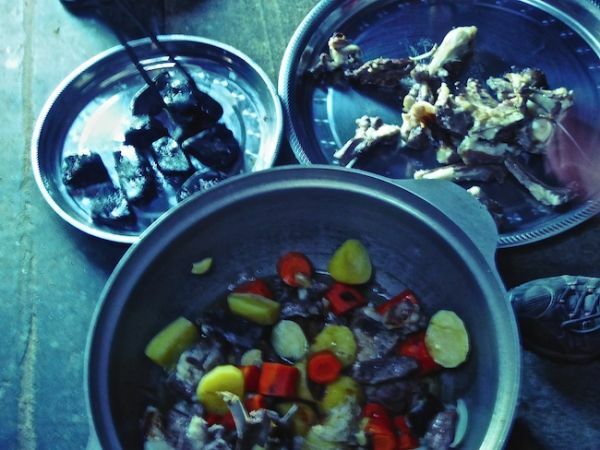 Khorkhog is made by cooking pieces of meat (usually goat, but mutton can also be used) and vegetables inside a container which also contains hot stones and water. The use of the stones helps distribute the heat around more, which cooks it more intensely. Khorkhog is usually made on a special occasions. Therefore, goat meat is saved and used instead of the everyday staple meat of mutton. 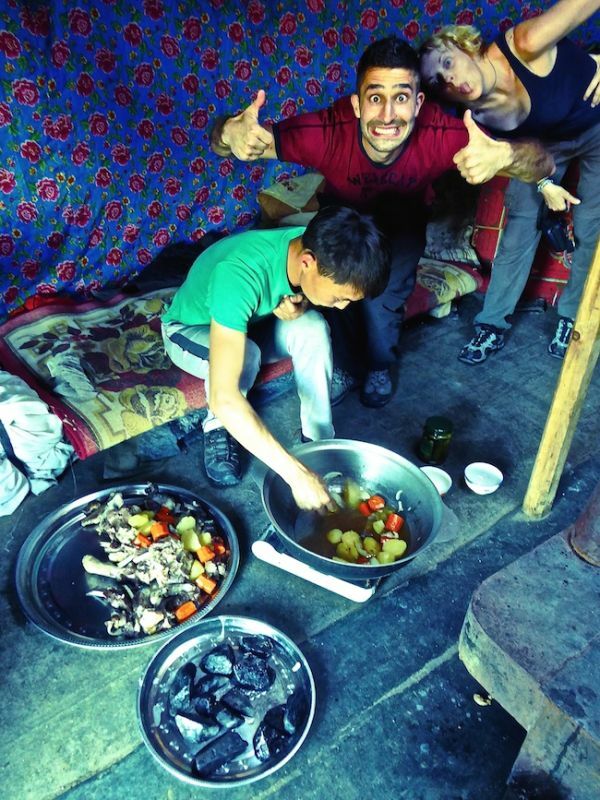 This is a recipe for khorkhog which we picked up when visiting nomadic families in the Mongolian countryside. This recipe is enough to feed around 6-8 people and easily filled up these two greedy boys. 1. Prepare the stones by cleaning them and heating them over coal for around 1 hour. 2. Whilst doing this, prepare the ingredients as set out above. 3. Put the water in a large pan with around x2 teaspoons of salt and bring to a boil. 4. Once the stones are heated, start adding the meat and vegetables in batches into the large pan and with each batch add a stone, so that they are eventually all distributed evenly between the meat and vegetables. 5. Add x2 more teaspoons of salt and some pepper. 6. Close the lid and cook on full heat for around 1.5 hours. 7. Check the pan intermittently to ensure the meat is not burning and add water if necessary. 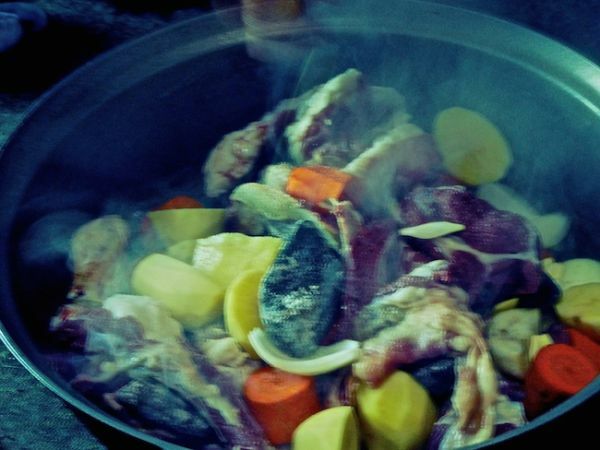 The juice from the meat will create a delicious broth which is also served alongside the meat and vegetables in a separate bowl passed round. Khorkhog is usually eaten without cutlery, just with fingers. After cooking is completed, the hot stones are traditionally passed around for people to rub them in their hands. It is said that cooking these stones in contact with the meat fat gives them healing effects. A competition usually breaks out between the men in the ger to see who can grip the stones for longest. We only lasted about 4 seconds…!